Our site is dedicated to present compelling evidence concerning a Great World Change. It invokes a number of areas of research, with dreams as the major key. The other areas of research include connections to crop circle formations, UFOs, ETs, synchronicities, and coincidences, signs in the sky, prophecies, myths, and religions. Many people are getting these dreams and visions as the millennium changes. The more participants we find, the better the picture will be of what is coming and how we should prepare for it. Join with us on an adventure that only individuals with inquisitive and searching minds have access to, and that is to travel inside your own mind to find the connection that takes you soaring out to the unlimited infinite universe beyond the physical world. Keep in mind that dreams are not given to us forthrightly, but couched in heavy symbolism, which might not even be for the physical world, but part of our spiritual dimensions instead. Careful analysis of many dreams will bring these things to light, we feel. These various fields are all interrelated, so it is essential to have some understanding of them in order to grasp the nature of the coming changes. It is comparable to putting puzzle pieces together into a larger picture. 10-16-97 - DREAM - I was told that all the missing files were on Joe's computer and that as soon as he sent them over to my computer, the puzzle would be solved. As soon as I knew that, they started showing me notebooks and files about crop circles, and the files came alive and became videos, and they showed me video after video of crop circles and in combining Joe's files with my files everything was known. 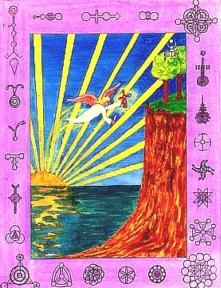 A dream-coincidence in 1994 indicated that the angel arising from the eastern sun in Revelation 7 represents dreams at the dawn of the new age. This is the marking of the foreheads with the mystic Tau Cross. The coincidence was my finding the book 'Dream Feather' the same day as the dream. This is a Native American tale of a boy who dreams of a feather coming from the rising sun and pointing at his forehead. He follows it up into the sky, and enters a seven-colored triangle, takes seven steps up, receiving new garments including a diadem on his forehead, and is enlightened. The feather symbolizes "Truth," which has been withheld until this time. In my cover picture, the angel holds the Tau Cross and a feather. The two trees represent the two olive trees in Revelation 11:11 standing up. The ideas about and organization began with speculations about the new science of Chaos in 1990. One of the speculations was that the Great Change may follow a similar course to the one that brought about this new science. Various investigators in divergent fields developed parts of the new ideas. The investigators did not know of each other's work, because they were in different fields, such as weather patterns, physics and pure mathematics. In some cases there was animosity between fields. It took about a decade for the researchers to realize they were working in basically the same field. Each was showing that there is order in chaos, that is, systems that were considered non-linear or chaotic had definite patterns, boundaries they stayed within. The researchers finally began to communicate, and the new science was born. They say that this new science is one of the most important discoveries of the 20th century. It applies to just about every field, as most everything in the universe has nonlinear elements. My idea was that various fields that seem divergent, sometimes with animosity, would come together in a similar way regarding the unknown parts of reality. I could see that this is already happening. For example, the new physics is similar to ancient spiritual teachings. My experiences often seem to show correlations between dreams, myths and crop patterns, among other things. 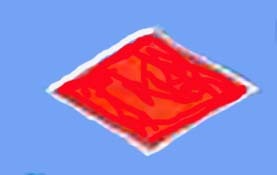 Some channeled material and UFO events seem to be related to the other fields. It seemed to me that many connections could be made if a large number of knowledgeable people worked together on it. I received a spirit message in 1982 saying that the greatest mysteries of all time will be unraveled. This seemed to be confirmed on a small scale by dreams and crop patterns. This was part of the basis of my theory. Another idea is that this process will be like bringing order out of chaos. The divided religious beliefs will come to a unity and bring about the creation of the ideal beliefs represented by the Tree Of Life. After the new science of Chaos came into being, the researchers could see that it had been held back by two main factors. Lack of communication between fields was one problem. The other was that science had become too specialized. Each scientist works in a tiny sub-field. Because of this, a grand view of things, such as chaos theory, is not likely to be discovered. I saw this as being similar to the situation in the unknown fields. The dream researcher usually knows little about crop patterns, UFO's, channeling, myths, etc. The same applies to the other areas. To grasp the big picture, one needs to be familiar with the other areas. We need communication, tolerance, and openness in this field also, if a new worldview is to come into being. I was astounded when the Mandelbrot Set appeared as a crop pattern about a year after I started my speculations about Chaos science. The Mandelbrot Set was primary in my speculations. In 1992, another coincidence happened. I had a dream voice message about an aperture opening, and a ray of light coming in. It effected every atom in our universe, causing a new perception of reality. People felt God's loving presence all about them, even in the atmosphere. The day after the dream, I happened to read an article about Gerald Heard in the Gnosis Journal. The article began with a quote of Mr. Heard about a Utopia seen at full aperture. Mr. Heard experimented with psychedelic drugs decades ago. He was apparently talking about a positive experience with the drugs. I think Mr. Heard and others have experienced something valid. As I read the rest of the article, I was amazed at how similar Mr. Heard's ideas were to those I had gathered. One of his ideas was that various fields would someday come together into a new world view that would effect a big change. He speaks of man ascending in a spiral path, and wrote a book called The Five Ages of Man. The Barbury Castle pictogram had a ratchet spiral with six steps leading into the triangle which seems to represent the Trinity. The north sun symbol had six lines and resembled an aperture. Hints suggest that this aperture will open and the Seventh Ray will come in. Other hints indicate that the Trinity/triangle is the subatomic basis of the physical creation, therefore everything in creation will be changed. I think this is related to the myth about Siva being able to destroy universes with his third eye. Mr. Heard was called a "scientific shaman." Seth (through Jane Roberts) once said that our scientists were asking the wrong questions, and that we needed "psychic scientists." In 1982 Seth said the scientist need work on awareness and perception. Benoit Mandelbrot seemed to fit this mold. He was not trustful of the rational in developing his ideas, and relied on his intuition. Mr. Heard also spoke of the split between the rational and intuitional, and the need to integrate them. As you know, this is major in my theory about the Great Change. Mr. Heard emphasized "unspecialization." This was one of the problems in developing the science of Chaos, and in my speculations about the situation involving the unknown parts of reality. He believed a new epoch began around 1912. Coincidentally, I had come to that same year by interpreting the sinking of the Titanic as a symbolic event foretelling the Great Change. Mr. Heard's unusual views began to form when he was a student at Cambridge University. This struck me as an important coincidence. The Mandelbrot Set crop formation was very near Cambridge University! All this does not prove the speculations, but my intent is to report dream-coincidences, and show that they seem to be meaningful, and predictive. When I first read of the intentions of COSMINAR, (by John Crowe) I felt that you were on track in this area. He is attempting to establish communication between the various people and groups that believe in a world change. As I see it, this will eventually involve many people from many fields. Within a decade or two (perhaps sooner) it will become clear to most everyone that something very major is happening, that we are being informed in various ways by other-dimensional consciousness. The new beliefs will reach the critical mass, keying the transformation. I hope this gives you a background as to how the ideas of an "organization" came to me. Most of the ideas I communicate have a background involving dream-coincidence. I never know if they are absolutely true, but I wish to tell others about them, and see if they have their own experiences and concepts to add. A dream-coincidence has happened that suggests a time when important events will happen. Late last year, my dream voice said, "The MER-KA-BA will not come for another five years." I remembered reading of that term "Merkabah" in The Keys Of Enoch, but I did not remember what it represented. I also knew it was a Kabalistic word. Dr. Hurtak says it is the Vehicle Of Vehicles, and the same as Ezekiel's vision of the Four Living Creatures. I wrote about the coincidence involving Ezekiel's vision in my "Humanity On The Pollen Path" essay. Four Barbury Castle pictogram shapes match well with Ezekiel's descriptions. This matches the Sri Yantra Star in several ways. 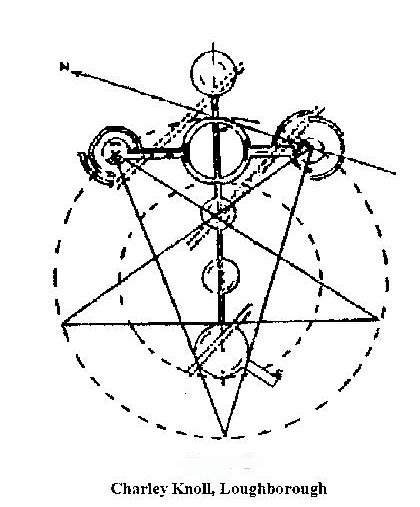 According to Blavatsky, this is the "vehan," or vehicle. The four Barbury Castle shapes also reveal a cross with circles at the corners and in the center. I believe this is the Tau Cross. The foreheads are also marked in the book of Ezekiel. This cross has appeared as a crop pattern. I recently read Millennium Prophecies, by A.T. Mann. On page 111, he shows an astrological chart where the planets will form a "Grand Cross" in August, 1999. This cross is aligned with the zodiacal signs of Taurus, Leo, Scorpio and Aquarius. He says these are the four beasts of the Apocalypse. Joseph Campbell said that the Living Creatures, with faces of the ox, lion, eagle and man, correspond to these zodiacal signs, and are related to the solstices and equinoxes. The four Living Creatures are also in the book of Revelation. Mr. Mann also mentions that there will be a solar eclipse on August 11, 1999. This was also pointed out in an article in a crop circle journal. The eclipse will be over England, the area where most of the crop patterns have appeared. My dream voice message about the Mer-ka-ba seems to correspond to this. The MER-KA-BA, which is the same as Ezekiel's "wagon," will not come for another five years. This would put the date at 1998 at the earliest. So, 1999 is very close. Dr. Hurtak, who claims he was informed by other-dimensional beings, says that the MER-KA-BA vehicle has the ability to "speak" to people. the sustenance of the oppressed lingers." My feeling is that many will hear voice communications beginning around 1999, either in dreams or in the waking state. This may cause fear in those who are not prepared, because our society teaches that this is a sign of severe psychosis. My hope is that our ideas will help in this regard. I hope to show that no psychosis is involved, and that it is very positive. New truths will come to many, directly through the speaking of the MER-KA-BA Vehicle. Instead of fear, the feeling evoked should be of joy; to be blessed with a direct communication from the Divine, helping in the Great Plan. Another possibility is that the new energy will be somewhat like an LSD trip, in the sense of flinging open the doors to the unconscious mind. Some will have a "good trip," others a bad or fearful one. This fits well with the idea of a "final judgment." Some hints suggest that we will judge ourselves. Dream symbols of this seem to be nakedness, being exposed, cluttered rooms, and dirty garments. I relate the fearful "trip" as being "slain," or thrown into the fire pit. It's a purification process where the old self dies, and the new self is born. If this turns out to be the case, then those who have already gone through the transformation process will be in a position to help those in the fire pit. It's like the experienced LSD user helping someone on a bad trip. Something like this was suggested in the dream of my friend Steve O'Neil. A crystal came up from the ground through a house. Everyone ran outside, but a ditch blocked their path. The people helped Steve climb up the side of the ditch. He tied a rope on a tree and threw the end down to the others, so they could climb up. Symbolically, he used the tree's strength to uplift others. (The tree represents the new knowledge) They then saw two crystals traveling underground at right angles, coming right at them. I had an overwhelmingly emotional dream in 1984 where Adolf Hitler experienced the full impact of the Karmic implications of his deeds. I then became him as he experienced the remorse and fear. I cannot describe the terror of it. I was forced to forgive Hitler. It seemed to be a little ridiculous at the time, but I came to see this as an important message. The idea is that forgiveness is given the instant remorse is felt for violations. The lesson has been learned. Further karmic punishment is not necessary. We are nearing the end of the Kali-Yuga, which is the same as the judgment of the great harlot in Revelation 17. It's the end of a karma or judgment cycle. I am trying to find out the real meaning of karma. It seems to be different than conventional concepts of it. It is not about a punishment or reward for past deeds apparently. It's more like a learning experience where we see various sides of things and learn not to be intolerant and judgmental. A recent dream-coincidence seems to suggest that looking into a mirror is a symbolism related to karma. 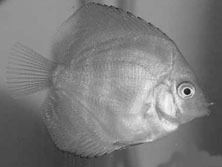 Distortion in the image indicates a build up of karma, a clear image shows the karma cleared. Another symbol is money or a debt owed. In "The Circular." (vol.4,No.4) the crop circle researchers are finding new things about the five-pointed star. The five-pointed star can be laid out within the T-cross. The most interesting is the T-shaped pattern that reveals a reversed (two points upward) five-pointed star in it's geometry. I think the shape is related to the T-type Tau. The three lower circles could be the lower chakras, with the upper ones representing the upper four. The central bisected circle is the Dual Deity symbol and the heart chakra. This suggests the duality balancing involved in the change to the heart chakra. I felt some confirmation when I read Charles Holderness's article. He says the formation might resemble the chakra system. The five-pointed star is related to Kali in the Tantric book. I am enclosing two pages from The Sacred Symbols Of Mu about the T-Tau. You can see the similarity to the crop formation. It could be that the T-Tau becomes the Tau Cross when the flower, like an aperture opening, blossoms. The Seventh Ray comes through, connecting us to the Divine. I happened to read the first pages of Blavatsky's The Secret Doctrine around the time I was reading the "Circular" articles. She explains the meanings of various glyphs found in very ancient documents. Every one has appeared as a crop formation in various forms. Among them are the T-Tau, and the bisected circle. She then tells of the reversed five-pointed star as being a symbol of the Kali Yuga. All this seemed to coincidentally tie in to the Charley Knoll formation, and the ideas I reported in my "Pollen Path" essay. It seems to hint that the Kali-Yuga involves the lower three chakras. I have been pondering about the way to best present all this material in the book. The nature of the subject and the unusual way it came to me is difficult to sort out into a logical, chronological story. The chronology, that is to say, the order in which the ideas came will be more difficult to follow in this form. I will include dates or general timing, as it is important. The point is to show that the dream-coincidences are predictive. To me, this is one of the most convincing parts of it. I just read your article, "Controversial Correlations And The Question Of Consciousness." Your experiences and conclusions are so very similar to my own, I thought we might compare notes. About five years ago I began to dream many dreams and a voice began to speak. Sometimes I saw geometric images as well. This led to studying myths, religions, crop circles, UFO events, and gathering the dreams of others. Coincidences happened constantly as if to verify that certain concepts were valid. Some of them were quite astonishing. Some of the material seemed to be predictive of certain crop patterns and UFO events. For example, I wrote many notes about the symbolism of the Mandelbrot Set and the science of Chaos beginning in July 1990. My most startling coincidence is actually part of a much, much longer chain of coincidences that tied together like puzzle pieces into a more complete picture. Not long after my dreaming experiences started in 1990, I drew a diagram around nine circular objects in a diamond arrangement. (A) This was based on previous dreams, inspirations, coincidences, and a Tantric Yantra design that I saw in a myth book. (B) Many more synchronicities continued to occur involving the basic nine-circle diamond shape. In early 1993 I began to write an essay about a theory that had come to me in some amazing, synchronistic ways which I titled, "Humanity On The Pollen Path." The idea is that humanity has been in a cycle of time progressing up the chakra levels, and that we are now at the 3« point, between the third and fourth. (the heart chakra) This all centered around Revelation 11:11, where the two trees stand up after 3« days. This was a bit of a surprise, because I have never been a Christian, and was looking at the Bible for pretty-much the first time. Dreams reported to me by other people, who knew nothing about my essay, seemed to confirm parts of it, sometimes in startling ways. As I was writing the essay in March, 1993, I picked up a book at the library called The Tantric Way. Almost every page had something that seemed related to my experience. Kali seems to have the same meaning as the harlot of Rev.17. St. John's vision seemed to be telling about the end of the Kali-Yuga, the Age of Iron we are now in. (symbolized by a reversed, two points up, five-pointed star) The cycle in the lower three chakras involves karma or judgment. At the end of the cycle, humanity will make an en masse leap to the heart chakra level, throwing down the beast of karma. This is indicated in Rev. 17:11: "As for the beast that was and is not, it is an eighth but it belongs to the seven, and it goes to perdition." 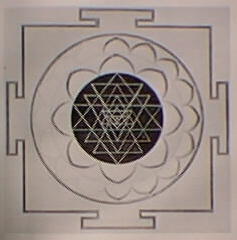 I came to a page in the Tantric book showing a Sri Yantra design. I realized that the star shape in the center was the one I had drawn back in 1990. I also remembered that I read a report in 1992 about a giant pattern found grooved into a dry lake bed in Oregon. 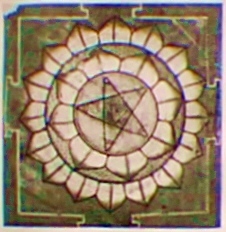 It was called a Hindu "sriyantra," but there was no picture. I found my copy of the report and was astonished that the story of the lake bed pattern was released to the news services the day after I drew the star! I went on to read about the meaning of the Sri Yantra. It is a path through the chakra levels from outward-inward. The outer part of the star represents the fourth chakra! "The fourth chakra, Sarva-saubhagyadayaka, or Giver of Auspiciousness, projects the realm of possibilities in spiritual ascent; it consists of the fourteen triangles forming the outer rim of the complex interlocking of triangles." See: http://www.greatdreams.com/plpath3.htm for comparisons of chakras. All this while I am writing an essay about humanity's leap to the heart chakra . . . it's stretching the imagination a bit to think this is purely accidental and meaningless. I sent a copy of my essay to John Crowe of the Cosminar organization in England. Two weeks later the Bythorn Mandela crop formation appeared. Some researchers related the pattern to Shiva, but the Tantric book relates it to Kali. 18th century. Gouache on paper. Kali is an aspect of Sakti, the feminine Deity consort to Shiva. Both are destroyer/creators. This is called death or destruction creation, and analogous to a seed growing into a plant. The seed is destroyed in the process of the plant's growth. The end of the world means the end of the seed stage in the lower chakras. This is indicated in the dream of Nebuchadnezzar in Daniel 2:31-45. The four metals of the frightening image are the same as the Hindu Chronology. and clay, and broke them in pieces." as symbolic of the Ages. The Book of Daniel that tell about Nebuchadnezzar's dream of the frightening image (Daniel 2:33-45). The image had a head of gold, breasts and arms of silver, belly and thighs of bronze, and feet of part iron, part clay. A stone was cut out by no human hand and struck against the feet of the image, shattering it. the stone became a great mountain and filled the earth. Daniel interpreted the four metals to represent kingdoms or ages. The fourth kingdom-age would be a divided kingdom. In those future days the old kingdoms-ages will be destroyed, and God will set up a kingdom never to be destroyed. "In this age, Vishnu had to incarnate himself in Christna, in order to save humanity from the goddess Kali, consort of Siva, the all-annihilating - the goddess of death, destruction, and human misery. Kali is the best emblem to represent the 'fall of man'; the falling of spirit into the degradation of matter, with all its terrific results. We have to rid ourselves of Kali before we can ever reach 'Moksha,' or Nirvana, the abode of blessed Peace and Spirit." The Golden Age is called the Crita-yug, the "age of joy," or spiritual innocence of man. I read elsewhere that there will be a return to the Golden Age in the future. It seemed to me that the Crita-yug/Golden Age is similar to the Garden of Eden. This gave me another idea. In terms of the "three and a half" symbolism, corresponding to the midpoint of the seven chakras, there may be a correspondence to the four metals representing the ages. The first Age is not counted, because a process starts after the "fall" from the time of joy and spiritual innocence. Therefore, the ages of silver, bronze and iron could correspond to the three steps, ages, or chakra levels involved in the time cycle. In Nebuchadnezzar's dream, the feet of part iron, part clay (the divided kingdom) could represent the three and a half point. The great mountain filling the earth, establishing the everlasting Kingdom, would then correspond to the fourth step, the Heart chakra level. 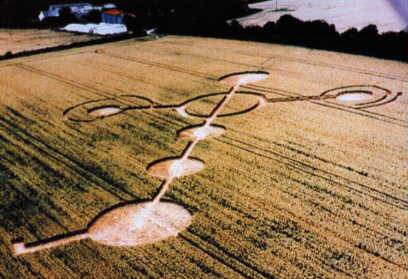 Three of the four metals showed up in the crop circle story in 1991. A group of several crop circle formations appeared at Grasdorf, Germany. Three metal plates were found underground, below the formations, one of gold, one of silver, and one of bronze. Engraved upon the plates were the same designs as the in the crops. The divided kingdom symbolized by the feet of part iron, part clay, seems to represent the 3 1/2 point. The first Golden Age is not counted because it was before the cycle began. Nebuchadnezzar's other dream in Daniel 4:10-26 indicates the timing. The great tree (en masse beliefs or knowledge from the spirit reality) was cut and banded, causing a period of insanity for seven years. These are prophetic years of 360 degrees each, giving 2,520 years and the date 1914 as the beginning of the Apocalypse. I had arrived at this conclusion by interpreting the sinking of the Titanic in 1912 as a symbolic event, a portent of great changes to come. The ancient tradition of Gematria numbers is apparent in many of these things. Draw a circle and divide it into ten parts of 36 degrees each. Punch in 36 on your calculator and hit the tangent button. Do the same for the next number, 72. The next two numbers, 108 and 144 have the same tangents in the minus direction. This is similar to the way a generator produces sine waves. As you continue around the circle, the same tangents are repeated, except for the top and bottom, which have tangents of zero. Full revolutions on the wheel give the same numbers multiplied by 10. (360, 720, etc.) The same holds true for higher decimal ranges. 144,000, for example, is 400 times around. You can find Gematria numbers with the key tangents by removing any zeros at the end and dividing it by 360. If the result ends with a .1 to .9, excluding .5, it will be a Gematria number. 2,520 years is related to Gematria 252. The 1,656 years between Adam's creation and the landing of Noah's Ark on the mountains of Ararat is another. It landed on the 17th day of the 7th month, (Genesis 8:4) which is coincidentally the date on our calendar when the Barbury Castle pictogram appeared. The square footage of the three corner circular areas matched that of the central circle. The total of the four came to 31,680 square feet, a number associated with the circumference around the New Jerusalem. 3,168 is a Gematria number meaning Lord Jesus Christ, previously associated with a figure in the Pagan religion. 31,680, divided by 6 gives 5280, or feet in a mile. 432 is related to the (symbolic) length of the Kali-Yuga, 432,000 years. The 12 circles of the New Jerusalem times 360 gives 4,320. 108 is the number of names of the Goddess in India, and 1080 is associated with dowsing energy. 1260 is not a Gematria number, but falls on the bottom mark of the wheel. 666 is also not a Gematria number, but falls exactly between two, just like 90 and 270. It is divisible by 9, like the other numbers, and adds to twice nine. (they usually add to 9 or 18) 25,920 (Gematria 2,592) is the cycle of the earth's axis wobble that causes the precession of the equinoxes. Divided by the ancient "soss," 60, gives 432. I got some of these ideas from a Joseph Campbell book, (I) and then in a few others. But I found out about Gematria from Carl Munk, who has worked with Richard Hoagland. His deciphering of megalithic sites on a global grid matched up with those found in Cydonia. After reading Carl's article, I came up with the idea of the Gematria Wheel. Carl shows the numbers, found in the ancient Mediterranean, such as the weights and measures of the Romans, and the time-calendars of the Mayans, as two sine waves. When the two main tangents are multiplied, it results in the square root of 5. This itself is a tangent, the tangent of the speed of light in air! He also told me about 5,280. It has the same tangent as 60, the number of perimeter stones around Stonehenge, and 67,800, the earth's orbital speed. It's the square root of three. He says that ten is the basic harmonic of the planet earth at its very core. I found this interesting regarding the Gematria Wheel, the Bythorn Mandala and the recent spider web crop pattern. There is much more to all this, but I cannot explain it briefly. The Sri Yantra also seems to be related to the New Jerusalem Plan, Ezekiel's Four Living Creatures, Noah's Ark, the pyramid, and the ancient concept of the "vehan." (vehicle) The Barbury Castle design is related - four such patterns make up this one. In my view, dreams must be brought into the picture by researchers delving into these fields, if we are to get a clear, uncorrupted understanding of the messages coming in so many ways. My dream voice once said, "The Keys to the Kingdom, He said, are dreams." I had a dream indicating that dreams are the Rosetta Stone of putting the big picture together. I also had an incredible dream-coincidence that clearly confirmed this. It's the "Power of the Music of the Dawn," indicated by the Angel arising from the eastern sun in Revelation 7. We must remember our dreams at dawn, at the Dawn of this New Golden Age. There are many similar dreams and incidents that I could share here but I hope by now that I have conveyed the interconnectedness and synchronicities that have been proliferating throughout my experience over the past two years. You may think I did a lot of research to find these connections but actually, the important ones just seemed to come to me without effort. This, in itself, is phenomenal to me. So much of it seems related to great mysteries, such as Revelations and myths, I am convinced that something of a huge magnitude or importance is occurring on our planet. The dreams of ordinary people have helped to convince me. The 'coincidences' seem to have a design and direction to them. 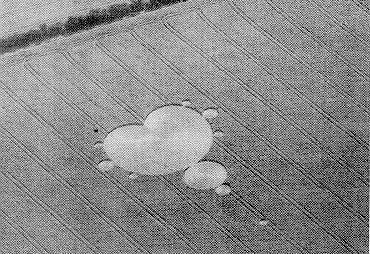 Conventional explanations fail to explain this, just as they fail to explain the crop circles. It seems there are many truths not yet 'proven'. My research is continuing, hoping to find others interested in sharing more about the crop circle/dream/myth messages. With luck, some will join me in this quest. It could prove to be important. In the months after I wrote the article, some of the dreams and symbols became somewhat like puzzle-pieces that fit together into a larger picture. Again, "coincidence"
I was in a large old house that had a linoleum floor. My children had all gone to school for the day. I decided it would be fun to work some jigsaw puzzles on the floor, so I got out all the puzzles and started laying out all the pieces like small area rugs. I hadn't started to work the puzzles, just laying out all the puzzles on the floor. This was a large room so I had plenty of space for lots of puzzles. Time was going by quickly and the kids came home from school and started arguing over the puzzle pieces and my son Bob started throwing puzzle pieces from one puzzle at his brother who was standing inside another puzzle. I knew I had to put the puzzles away before the pieces got destroyed, so I asked Bob where his school lunch box was. We found that - it was a bright yellow box with Mickey and Minnie mouse on it. I opened it up and it was full of smelly and damp underwear and socks from gym class. So I pulled it all out and threw it towards the laundry room to do the laundry when I was done putting his puzzle into the lunch box. I hoped it fit in there. Then I noticed that some of the bocce balls were melting and I realized I had covered baseballs with snow to make them bigger and now they were melting and getting the puzzle pieces wet and warping some of the pieces as they got wet. She started telling me that I had to clean up the mess I had made with the puzzles, so I looked to see it from her viewpoint, the whole street was torn up into little puzzle pieces and piled every where. There was a pit in the middle of the street and I saw a white kitten scurry down into a hole in the ground. I immediately thought that there was an underground space and I would have to fill the hole with sand. But I didn't want to kill the kitten or any other animals that had gone down into the underground chamber, so I thought maybe if I flooded the underground chamber with water, the kitten and whatever else was down there would float to the top and come out of the hole. Then Carlotta showed me that someone was constructing a brick building by the side of the road and I hadn't left room for the machinery or for them to erect their new skyscraper. She said I needed to hurry and put the puzzle pieces together. I turned around and looked where she was pointing and saw that the entire street was broken up into little puzzle pieces as far as my eye could see. I typed up my dream and sent it to greatdreams-forum and a few friends. One of my friends answered me by telephone, telling me that she had a dream about jigsaw puzzles last night as well. In fact, she was taken to a tropical place and taken into an office where she had a huge teak-wood table on which she was to do her 'dream job' which was to put together jigsaw puzzles. I found it interesting that I had laid out the puzzles and her job was to put them together. 3-21-92 - DREAM - I received a letter from a high school buddy. It seemed to be written in response to one I wrote to him regarding my travels around the country and my interests in the future and UFOs. The letter was written on very unusual paper. It was double thickness, with the top laying having green and blue sections in unusual patches and those patches looked like a jig saw puzzle put together. It stated that I should be sure to have a small TV with both AM and FM radio on it with a portable battery for use when there is no electricity and a portable satellite dish to pick up stations that were transmitting from a distance. I was also given me the name and address of a man named Clarence Compressing Company on South 108th St. who put out a newsletter regarding UFOs in the local area. It also said that we definitely will experience eclectic travel in the next couple of years, meaning UFO, astral travel. One of the most sinister military facilities is known as CCC. Although it is not confirmed what CCC actually stands for, most sources have it as Corsham Computer Centre. Rumours have it that there is a super computer there linked to GCHQ and the NSA, but again these are unconfirmed. CCC is different from the other facilities in that it is well hidden away, there are no fences or warning signs, one can walk right up to the bunker entrance. The rest of the base has really high profile security, fences, signs, dogs, security patrols. CCC too has security, but it's covert. The place is so secret the powers that be have decided the best security is not to advertise its presence in the first place. 11-18-92 - DREAM - There was a big argument going on over some project and the key answer was given in a puzzle near the top and the answer was ANSAVER. It really should be written ansAver. ansAver = 0 in a stack of statistical sum initialization. DREAM - There was another argument going on over the same project and the key answer was given in another puzzle and the final answer was AVER. 12-17-97 - DREAM - I was on the computer, typing in urls, trying to make a pattern so that if you clicked on one, it would take you full circle through the sites back to the beginning from whatever point you started in a ferris-wheel type pattern. I was not able to solve the puzzle. Let me preface this dream by saying that I don't think this dream was meant just for me, but for 'everyman'. That means you should pick out the part you feel comfortable in, put yourself into this dream, and do your part too. I believe that this dreams explains all the reasons why I am where I am now, why I've gone through everything I've gone through in life We can all find our places in this dream. Please pass this dream and letter on to as many people as you feel led to, and have others do the same. Our goal is to solve the puzzle and we need lots of help. I went to the hotel I was going to manage. There didn't seem to be any bosses to ask questions of, but there were lots of people with needs and who needed help. Nobody was being fed to start with. I went to the kitchen and found meat half ground up for sausage, but the machine was dirty, the sausage half dried up. I cranked the handle once and it was a mess, the old dried up meat was mixed with the new meat. I knew I'd have to throw out all the old meat and start over fresh. For every task that needed a machine, I saw 100 machines standing there waiting to be used to do the job, but there was nobody doing the jobs and the machines were old and antiquated and not up to the task of the modern day life style. Every time someone came up to me, I had to find a solution to the problem, find a machine to do the job and find a person who could do the job. This went on for hours and hours and I saw hundreds and hundreds of types of machines. They were all white and all lined up waiting for workers to turn them on to do their job. I went upstairs and looked out the window where the sun was shining brilliantly. I felt like I had been asleep for years. I heard water running in the bathroom. I looked at the clock and saw that it was 9:30 a.m. and my mother was in the bathroom getting washed up to start the day and she had needs to be taken care of. I went back downstairs feeling quite naked and undressed for work. A woman brought me a beautiful heavy brocade, multicolored robe to put on that one of her ancestors had worn. It was really heavy but when I put it on, it fit perfectly like it was made for me, and it felt wonderful to wear it. Three women came up to me. One of them was black. They began to sing a song about God and how God had said he would provide a wagon for every task that needed doing. In my mind I knew that I had had a dream earlier in the night about a wagon my children had brought me full of books and I knew that if I looked in the Concordance to the Bible I'd find the answers to my dreams in that way because the symbolism was in the Bible. I took the black woman by the hand, and she in turn took the hand of the next woman, and that woman in turn took the hand of the next woman. They continued singing about God, and I led them to the next room where my baby was being cared for. I went into the room where my baby was and asked for the baby. The woman caring for the baby had him wrapped in a black towel. I took the baby from her to hold him. She started to hand me all kinds of other things to care for him, a pink diaper bag and hundreds of bottles of formula. I said, "No! You can keep all those things and throw away all the old formula, I will be feeding the baby from my own breast and nurse him back to health. I told the singers to stand there and keep singing their songs and carried the baby with me to the kitchen where people were lining up to be fed. There were workers appearing now also, and I gave each one a small task to do and overall the first step towards feeding the people would get done. I heard a lion roar out the window and saw a magnificent lion roaring, sensing danger over the hill which was quite near. I knew there wasn't much time to get done what had to be done because something was on the other side of that hill coming towards us that we needed to be prepared for. A man came and asked me for help. He said he needed a train engine to perform a particular task. I told him that all the trains we had were too old for the task, but I'd get him a new modern engine to handle the job. At that moment, I knew why I had spent the last 11 years learning how to problem solve, because no matter what the problem was, I knew how to find the solution to it. I asked the man to bring me the yellow pages from the phone book, intending to find a train engine manufacturer, to make a new engine for the man. Then I asked another person where the light switch was for the hotel and I went over and pushed the button and all the lights came on. We were now ready to start the day's work. 10-31-97 - DREAM - These were gnostic dreams like puzzles. Each one was a puzzle in itself, but then I had to layer five of them one atop another to get the bigger picture. 1997 - DREAM - I was in a yellow room, greeted by six women and told them my story. Each in turn gave me appropriate feedback and approved of the name I chose for myself. Swept to a valley. Overlooked by a steep cliff. Many people were having a gather. Food, games and reunions. These people were of all different races but all with common beliefs. During this gather, I noticed a warrior on the cliff's edge throwing down to the crowd shot putt sized lead balls. As the day progresses, I became aware that I was the only one who noticed this warrior and began deflecting these balls. Then the truth dawned on me that this warrior was throwing the balls at ME! Swept in a room with an examiner. I was told I had to accomplish all three tasks in a timed period. On to the first task. I was shown three images and asked what the common thread is to the images. My answer...the Tree of Life. Swept to an underground cave, I didn't know what to do. The warrior was throwing the balls at me through rectangular windows in the top of the cave, at ground level. I knew then I had to find a compartment in the stone with a key I had. Out slid a crystal wand. Swept to a long dark hall. One of the doors I had to choose to find the final task to accomplish. Passing by an open door with children inside, I stopped. This is the door. I walked to a wooden chest with many drawers and hidden panels. I opened one and took out a puzzle piece. A small girl took out another, handed it to me and another older girl handed me a third puzzle piece. I put them all together. Swept back out to the gather. This time it was night, or what appeared to be night. There was no lighting but the ability to see was unhampered by a luminescence that seemed to emit from everything. It was a ceremony. A ceremony in my honor. A very tiny child/woman climbed into my lap and congratulated me, praising me and saying how long she'd been waiting for me to come. A very old, old man stood up to the hundreds seated on the ground around him and said "We're here to welcome the Ambassador of Light." Chanting and singing began and when it quieted I began to talk when the woman in my lap said, "not quite yet. They're not ready." 6-16-99 - VISION - A man dressed in a white robe standing in a big round circle with a beautiful mandala around him. Around the border it said, "The Community of 500,000 is ended." I then saw the same white robed man standing in a sideways diamond shape. A voice then said, "7 - 11:11 includes Victory"
I heard the sound of a rooster down the street, but embedded within the sound, in my mind it said, "Texas"
I then had a vision of putting together a puzzle in the center square of a table. Many of the pieces were old and crumbling. Some maintenance men were laying a new linoleum floor next to me. I said jokingly, "I could use some of that over here." At that, the young man pushed me aside to lay in a solid piece of yellow linoleum in the center square. It was then I realized that it would cover up all the details of the puzzle pieces and we could see them no more. It would be like starting over from scratch. I then had a vision where I was visiting my friend Loretta. I was kidding her and saw a built-in dresser in a closet. I said, "Just for the heck of it, let me see if you are still so neat!" I opened the 3rd drawer from the bottom of 7 drawers and sure enough, she had sections in the drawer of colored hair rollers, red, brown, and some other color. There was nothing in the front section. Each section was lined perfectly with these rollers standing on end perfectly with others. None was out of place. It reminded me of people, all segregated by color. 7-27-90 - VOICE - Upon waking, I heard, "In unstructured world, how do you get in if your puzzle pieces don't have the right notch and you won't fit in." Later I heard, "Take the blue one or red." Reminds me of my oversoul dream, also gang colors. The first sentence reminds me of DNA and picture over Jeff's puzzle pictures. He has two on his desk. 2-23-92 - DREAM - I was at home, yet at work. There was a cement stairway with very narrow treads, that was overlayed with thin tiles for walking on. The thin tiles were so compressed together that walking on was almost impossible for anyone except me. So, I decided to mak it a project to straighten out the thin tiles so they were even and more accessible especially Becky who needed to go upstairs. When I went downstairs, I went to have breakfast and I saw that the milk was bright blue and I didn't think it was fresh to drink. I dumped it down the sink, but no matter how many times I rinsed the bottle with water, the contents were bright blue. I wanted to get fresh white milk for my children, but I had no money to do so. I asked their father to get some fresh milk, but he became so angry that I didn't want to do it myself. I convinced him of the truth of the matter. He left to get the milk and I turned around to see that I had one last batch of dishes to wash and these were the dirtiest, greasiest ones. I was determined that they would all be perfect. I then went to the bedrooms to make sure that the bedrooms were clean and the beds made with their red and blue quilts. I saw that many puzzle pieces were on the floor and I hollered at the children that they had better get picked up and put in the proper boxes. I bought my daughter a toy that had a little red dressed dolls that went around and around on swings. She wanted to take it outside to play. I said, "No!" My mother stuck up for her that she would take good care of it. I knew that it would get dirty, it was meant to be played with indoors. I said, "I would rather give her $10.00 to run around with it and keep the dolls for myself so I know they stay clean, knowing that they were more valuable than that. My mother said, "okay" and we made the exchange and I took the toy back. I then went to the office area where work was being done on projects. Someone else had cleaned up some big red pans to work in, but they still had some grease and sand on, so I took it upon myself to wash them to perfection, using hot water on the grease and cold water on the sand so as not to waste the hot water where it wasn't needed. My boss said that there was still some grease on the old silver pans, but I told him not to worry about the old ones. My boss came and asked me if I would be able to midnight requisition some long sleeved sweaters and stools to sit on so we could work on a project and I would also need to get 12 silver, square pans. I would need 4 pink, 4 light beige, 4 silver and black sweaters and stools. The one thing I had to be careful of was that no ones name could be on the stools so if someone came looking for them, they could not be identified. I agreed. Another man, who I think was my bosses boss or one of his peers asked him if I had agreed to provide this equipment and he said that I had. They were both relieved to know that. I then went into another department to look things over. I had friends everywhere, but the problem was that I was being watched. My ploy was that I carried a crumpled piece of white paper with me to throw in a waste basket so it wouldn't look I was there for no purpose and just wasting time talking to my friends instead of working. but when I got to the point where I needed to throw away the piece of white paper to save my cover, T.M. picked up the trash container to throw away the trash. I tried to signal him what I needed to do, but the was already holding the trash container and I knew I would have to tell him of my ploy so we wouldn't be working at cross purposes or he would spoil the ploy and prevent me from completing my part of the project. We just barely get past one tragedy when we are faced with another one. One can hardly catch their breath in between, in the past few years. Though we can understand and believe in life after death, one never gets used to the idea that 'we too' will meet our maker one day, and we hope to put that off as long as possible. Meantime, we are faced with prophecy of death and destruction, doomsday prophecies of the worst kind, and worst of all is the Bible's Book of Revelation which we seem to be living through right now. Ever since I started journaling my dreams and visions in 1981, it has been like a big puzzle to figure out what is going on, as my dreams are not just about my personal daily life but about the larger unit - mankind - including prophecies of death and destruction. This morning - 7-25-99, I had another dream about working on a puzzle in the shape of a calendar and the puzzle pieces had all kinds of strange looking long arms and it didn't fit into a nice square boxed calendar. All of a sudden, the calendar changed into a wheel with many divisions and the last puzzle piece slipped right into place. That was pretty neat. However, when I woke up, and was thinking about the dream, I had a vision of a greeting card with a stylized black and white drawing of a shape I couldn't determine what it was. The card opened up and the same shape was inside and the ends of the lines were fading quickly. I realized then it was like a rock art drawing of a bison and at the same time, into my head came the word 'DEATH'! It seems that it has always been with us. 7-3-00 - VISION - I was laying in bed, unable to sleep. I was thinking about Anna Hayes and the possibilities of a new web site for her and where it might be placed. "The is the artful voice " ... and I saw the words 'House of the Sun'! 7-20-00 - I started seeing visions which were also ET related. These were supposedly messages. I saw three 'band' names which I can't remember, but the songs they sang were like, "Everything comes in puzzle form", and "We don't answer question." I can't recall the third one. One of the band names I think was Hubbard ... the band names and songs faded so fast I almost couldn't remember them at all. I feel lucky I remember what I do. It seemed like the band names were short and easy to remember, but I think the messages were more important than the names. I then saw a light blue check with the money amount as ' m.mmm ' I didn't see that it was made out to anyone and not signed either. I then saw a bright sheet of paper like a brochure. The name Hubbard was on it twice and it seems that Hubbard was also one of the band names I had forgotten. This was one of the lines ' 78 words'. 1-31-02 - DREAM - I was living and working in a place that was a combination of businesses owned by a Jewish Judge. He was in process of hiring 4 new guys to work in his garage, which was furnished 1/2 with exercise equipment, and the other half which was a car repair place, but was empty at the moment. He wasn't there when the 4 unemployed men arrived, so I began the interview process myself. Then the Judge arrived with three other authoritative-looking men, all about 7 feet tall and he took over the interview and told them to report back at 7:00 a.m. the next day. There was a slight discussion to make sure that 7:00 a.m. was okay with everyone. I always got up at 5 a.m. so it was okay with me. At the same time, we were getting an 18 wheeler big rig to go somewhere, however an injunction had been obtained so that we couldn't pull the truck over the property line. So 24 blonde people with ropes/lariats over their arms had been hired to unload all the boxes off the truck, walk out into the street and reload all the boxes onto a truck that was already in the street. There was no law against that and nobody could stop us. I walked out of the garage to go get dressed, as all I had to hide and protect myself on top was a large piece of green cloth and I was dressed normally from the waist down. As I left the garage which had 3 cars parked in it, other people were moving the cars in a certain order, otherwise they would get bumped and scratched. The order it was done was most important. Outside, I saw new blue and white paint being sprayed on the building by my son Thomas who was suspended near the top of the building by a rope. His two sons were helping out. The apron of the garage was spray painted sky blue, and the side of the building was white. Across the street on a building had been spray painted - the whole permit for this move wwas spray painted in Hebrew, very formally, including the number of the permit (a long number). Next to the permit was a clock with the time that said 11:11. I then went to a different part of the garage where all the stuff was being repacked. All of the dinner dishes were in a box, but it seemed to me the box was too thin to support heavier boxes on top of it. There was a lot of dark-wood antique furniture standing around, which had been dismantled. I wouldn't take anything that didn't have all the pieces ready to reassemble. One table was made like a debarked tree stump. Part of the table top was in pieces. On two of the three pieces were there. It wasn't broken in straight lines - the table top had been made from 3 grandly scrolled pieces of wood held together like a great puzzle. My son Ken was there and I suggested he take the 1/3rd of the table top that was 1/2 moon shaped. It had U.S.A stickers on it, with red, white, and blue flags. That was going with us. 8-18-02 - I was working in a large office building. My boss (who I think was the Jewish Judge) had a crush on me and was always watching me. The feeling was not mutual, but I couldn't help but see him watching me. During the lunch hour, some girlfriends and I had a hugging fest and he was watching. Even a young girl whom I didn't like much came over and we hugged. Afterwards, I went to some singing rehearsals where some young women were trying out for a job. The boss was there and said, "It's not enough to be 'good' anymore, you have to be a Superstar!" He then said to me, "Come with me, I have something for you!" He then handed me a huge Minnie Mouse statue about 3 1/2 feet high. Minnie Mouse was wearing a bright red dress and had huge black ears. She was holding an old fashioned telephone in her hands and she was also a lamp. My boss said, "Let's put it on the desk in the office." I thought we'd put it right in front of the office, but he said, "Lets put it way in the back. 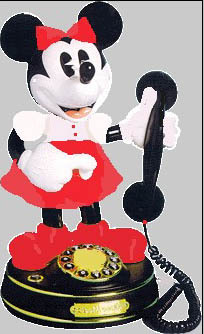 My boss was still hanging onto the telephone cord and I was holding Minnie Mouse and we didn't exactly follow the same path to get to the back of this huge office. I took the center aisle and he took the far right side and he was forced to come to the center aisle as well and we had to walk on some large puzzle pieces that some people were putting together on the floor. The boss took Minnie Mouse and set her right in the center at the back of the room and turned on her lamp and said, "She is bright enough to light up 9 football fields!" I was truly amazed that he gave me this gift. NOTE: A football field is 300 feet long by 160 feet wide. Perimeter = 300 + 300 + 160 + 160 = 920 feet. 1 football field x 9 = 8280 feet. 432,000 is the length of the Kali Yuga - our time cycle. The end zones are 30 feet each. The total is 360 or 120 yards. 12-17-03 - DREAM - This dream was implanted as it occurred after I heard a loud beeping sound in my left ear and asked for the message. I was working in a large office in the purchasing dept. My boss was out of the office so I had his folder of working orders on my desk. There was only one purchase order in it which hadn't been placed yet. My boss came into the office with another man. They closed the door behind them and I heard them on a speaker phone conversation with his daughter. While they were talking, the approval came in for the purchase order. It was for 15 bricks to repair something - that was the last purchase order to place. When the phone call was over, the men left and I took the purchase order file into the office, and there was a young woman sitting and taking dictation of everything that had been said. I hadn't realized she was in there. The woman looked familiar, but I can't remember who she is exactly. I called her Miss Perfection because she was going to clean the office before we all went home. There were 2 puzzles on the floor -one with small pieces and 1 with large pieces. These had to be put together before we could leave. So, I did the large pieced puzzle. It was of the United States. The right half of the U.S. was divided from the left half, at the Mississippi River. I finished up my part of the cleaning and left to go home. On the way, it was like I was flying over the roadway and all the traffic was going East and people were in a panic and passing each other in their hurry. I saw two cars crash and roll end over end. I stopped to access the crash and damage and I watched, along with other people as the car repaired itself into a picture like a house until it looked better than brand new. It was amazing to watch. I arrived at my apartment building and met Blair in the hallway. She was partying with friends on the 1st floor. She stopped me and asked me if I wanted to play Bridge with her. I thanked her and said I wanted to see what my apartment had been doing all day. I took the elevator upstairs. I worried that I didn't have my keys and searched the pockets of my coat and another coat I was carrying. The keys fell out on the carpet, along with long strands of hair. I noticed there was a 4" patch on the door above the lock, but I put the key in the lock quickly as I heard ominous angry male voices behind me. I turned the key, opened the door, entered and slammed the door behind me so I didn't see who the voices belonged to. I turned around and my house was wall to wall computers with lights flashing everywhere. There was a cot and a chair in the room to sit or lay down on and that was it. The rest of the place was wall to wall computers. There were some small size people running the computers, but I was too stunned to actually look at them and see who they were. 3-8-03 - DREAM - I was in a building on Wisconsin Ave., in Milwaukee, which was like a restaurant or meeting-hall place, located just past 33rd St. I was getting ready to go across the street to another place and speak to a group of people about SACCREATION, which had to do with prayer beads that were in a ring about 6" across that were turquoise blue - they may have been actual turquoise. I was standing there, thinking about it by the counter and someone - a young woman delivered to me as a gift form a man - what looked like a steepled milk carton with extra sides on it so it looked like a church. On the steepled roof, was a lift-up lid to drink the milk from. I took the milk carton from the woman and set it on the counter and wasn't really planning to drink it, but another woman suggested that I had better not drink it because it was probably poisoned. At that pint, I wondered if I should call the cops so they could find the man who would send such a thing to kill me. I also wondered what was so important about SACCREATION that I would have to be stopped from speaking about it. I went outside then with some other people, looking in parking lots on the other side of the street for the man's car, wondering how he would know my car well enough to know I was there. From high above the street, I saw a sleek blue car driving up and down the street between 33rd and 35th St. From ground level, I was seeing a series of silver cars in a variety of sizes and shapes, trying to determine which was Joe's car - the one I had come in - and I didn't find it. I went back to the building and was talking to my friend Judy about the situation. She was also trying to help me decipher the puzzle of why SACCREATION was so important to try to stifle that I would have to be killed to prevent its' teaching. While I was talking to her, she suddenly fell down and blood started squirting out of her head behind her left ear. I knew she would bleed to death if I didn't stop the bleeding because that was her life-energy, so I put my index finger on the bleeding spot that was really squirting a lot of blood out in an arc. I stopped the bleeding with my finger. She got up again and I started to try to figure out why SACCREATION was so important I should be prevented from speaking about it and she stopped em. She said, "Don't talk about it - its too dangerous." Then she walked into a closet to hide. Mikel told me to visualize the Universe as a jigsaw puzzle with only the border in place. There is a large box sitting beside the puzzle with all the pieces in it. Each piece represents a soul-self. It is up to me (each of us) to find out which piece represents me (us) and where it fits into the overall scheme of the puzzle. Only when all the pieces have been correctly placed into the puzzle will peace come to the Universe. If I attempt to place or force my soul-self into the wrong position, an imbalance naturally occurs. That imbalance causes a reaction such as the ripples on water-it not only affects me but it travels in a non-ending fashion and directly or indirectly affects everyone and everything in the entire puzzle (Universe). What's buried at Oak Island? How did the moon get exactly where it is? Is there sentient life on other planets in the Universe? How did human life really begin? Why do humans come in 5 basic colors? What is causing crop circles? How many previous civilizations were on earth? What really killed all the dinosaurs? Does a falling tree make a sound if there is no one there to hear it? Was there really a Big Bang in the Universe? What was there before the Big Bang if there was one? How much dark matter exists in the Universe? Will the Universe keep expanding forever? Do we live in more than one lifetime or is this it? How do plants communicate with each other? Where do souls and/or consciousness go during a Near Death Experience? How did animals get to be encased in stone? How many people participated in the bombing of the Murrah building in Oklahoma in 1995? Did the pilot of Flight 900 commit suicide on his own or was he a terrorist suicider? Was the downing of Flight 700 terrorism? What causes the Taos hum and other hums under the land in the U.S.? How does the mind/consciousness control telepathy, bi-location, astral travel, telekinesis.